Since we’re in the heart of manatee season I thought in this blog, I’d give you some awesome manatee facts. Yours truly is actually a Florida Manatee. With that said the Florida Manatee belongs to the aquatic mammal order Sirenia. I also have a very close cousin, the Antillean Manatee. Both the Florida Manatee and the Antillean Manatee are actually a subspecies of the West Indian Manatee! If you guessed Florida Manatees are found along the coasts of Florida, you’d be correct. However, the Antillean Manatees are found in the Caribbean, in the Gulf of Mexico and Caribbean coasts of Central America, and in northern and eastern South America. Manatees are also sometimes called “sea cows” because of our unique vegetarian diet when all we eat are aquatic plants. We also have a large whale-like body, which tapers down to a paddle shaped tail. And we have two forelimbs called flippers, which help steer us, along with our paddle shaped tail. The average length of our body is ten feet and our average weight is between 800 to 1,200 pounds. However, on some occasions you can find a Florida Manatee’s length measuring up to thirteen feet and it can weigh up to 3,500 pounds! Manatees are warm-blooded and need water temperatures of at least 68 degrees Fahrenheit. If the coastal waters get any colder than that, they become cold-stressed and eventually could die if not found in time. That’s why in the winter months, especially during manatee season (November 15 – March 31), manatees make a dash into the warm balmy waters of Florida’s natural springs, such as Blue Spring State Park in Orange City or warm water run offs of Florida’s power plants, such as Manatee Lagoon in West Palm Beach! 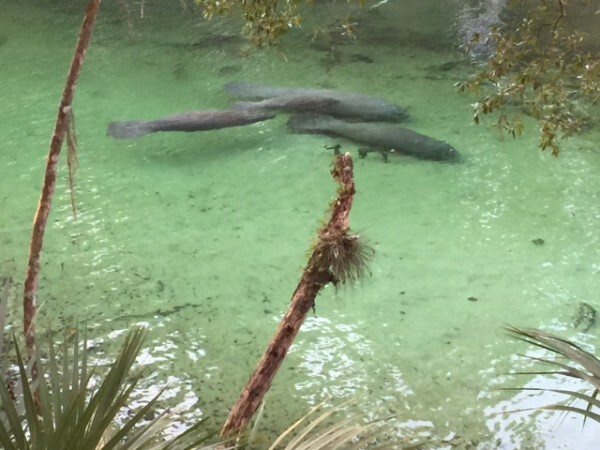 In both of these places, the water temperatures run right around 72 degrees Fahrenheit, which is absolutely perfect for manatees. Then in the warm hot summer months, manatees love to travel out of Florida. In fact, these marine mammals can navigate as far north as Cape Cod, Massachusetts and as far west as Texas! However in September, when the waters begin cooling down, manatees need to get back to their home territory and habitat in Florida or they could die from the cold! That’s what my first book (Kobee Manatee®: Heading Home to Florida) is all about. Stay tuned for more of my blogs on awesome manatee facts for fun!